The final Dalek story of Classic Who. Remembrance of the Daleks also marked a radical change in the character of the 7th Doctor. Initially at the urging of Michael Grade to supposedly counteract the levels of violence in the Colin Baker era, the 7th Doctor was portrayed as a clown, but from this story on he would be a much darker, more manipulative character. The Doctor and his companion Ace arrive 1963 London near Coal Hill School where the first Doctor arrived many years ago. The Doctor claims to have unfinished business that he needs to clear up. The Doctor discovers that two warring Dalek factions are here. One, the renegade Daleks who follow a black Dalek, the other the imperial Daleks who follow the Emperor. The renegades base is on earth, whilst the Imperials is a gigantic mothership hovering above the earth. After a showdown with a renegade drone and some soldiers, the Doctor investigates Coal Hill School and discovers that the Imperials are teleporting their minions to earth via a transmat in the basement of the school. The Doctor deduces that the Daleks are after the hand of omega. The Hand of Omega is the device that Omega used to create the eye of harmony, which ultimately gave the Time Lords mastery of time and space. Though both Dalek factions can time travel, the Hand of Omega will make the Daleks as powerful as the Time Lords and allow them to decimate all of time and space. The Doctor buries the Hand of Omega in a nearby grave, but the renegade Daleks human servants are able to find it. The renegade Daleks are served by a former Nazi sympathiser named Mr Ratcliff. Among his followers include a member of Group Captain Gilmore’s platoon Mike, who is helping the Doctor contain the Dalek civil war from spilling out into the streets of London. Ace develops feelings for Mike until she discovers his true nature after which she is heartbroken. The Doctor stops the renegades from leaving with the Hand of Omega by sabotaging their time vessel. The Imperial Dalek forces who are greater and have a special weapons Dalek, slaughter all of the Renegades except for the black Dalek who flees the battle. Mr Ratcliff is killed by another of the Daleks human servants, a little girl that they have taken over, whilst Mike escapes with the Dalek time machine. The Imperials steal the Hand of Omega and take it back to their shim. The Doctor contacts them and demands that they return it. The Emperor of the Daleks reveals himself to be Davros and tells the Doctor that he intends to use the Hand of Omega to turn Skaro’s sun into a source of unimaginable power, and that the Daleks will then destroy all earth and Gallifrey. The little girl who serves the Daleks kills Mike and confronts Ace, whilst the Doctor faces down the Black Supreme Dalek. The Doctor tells the Dalek that his home planet is destroyed, and his race is dead. The black Dalek refuses to believe at first but when reality hits home it goes insane and kills itself. Upon its death the little girl is freed from its control, though sadly she is left emotionally broken by the experience. Remembrance of the Daleks is a fitting end to the Daleks for the classic series, not only because its a fantastic story to see the monsters out on, but also because in many ways it brings the monsters back to their roots and resolves a lot of loose ends. First and foremost Remembrance returns the Daleks to being the centre stage again. Though Davros appears and is integral to the plot, its only in the last few minutes. I liked Davros but it is true that he was overshadowing the monsters a bit too much. The monsters are also suitably formidable and dangerous here too. Only the most powerful weapons are shown to be capable of taking down a lone Dalek drone, and at one point the Doctor even mentions that the Dalek mothership is capable of cracking the planet open like an egg! An old weakness is also finally conquered as we see a Dalek ascend a flight of stairs. I must admit I think its done far better here than in the revival. The revival just goes for a full CGI option, whilst Remembrance actually uses a proper Dalek prop and balances it on several poles that they keep hidden. This story also returns the Daleks to being parallels for the Nazis, by having a former Nazi collaborator work with them. He’s not the most complex example of this type of character, but still its good to see the trope being used right to the end, and there are some wonderful little moments where we see how Ratcliff is drawn to the Daleks ideology for much the same reasons, and how his bitterness at being rejected for his beliefs drives him on. The relationship between Davros and the Daleks also takes a great new turn in this story as well. Davros has finally managed to gain control of the Daleks but its at a cost to his for want of a better term humanity. Davros knows that the Daleks will never accept him because he is not one of them. However if he creates an army who are simply loyal to him then they won’t be as effective as they will just be mindless drones who can’t think for themselves like the Necrosian Daleks who were destroyed easily. So Davros changes himself to the point where he now is basically nothing more than a glorified Dalek. I feel that Remembrance served as a brilliant way of ending both the Daleks and Davros, yet also leaving the door open if they wanted. At this point it must have been obvious to John Nathan Turner that the show wasn’t long for this world. It was despised by virtually all of the heads of the BBC, sci fi as a mainstream genre in the United Kingdom was on its way out, and the show had been consigned to the graveyard slot. Thus Remembrance resolves all of the dangling plot threads that have been building up since the 70s. The Dalek civil war finally comes to an end with Davros at last gaining control of the Daleks, but at a cost to his own self. The Doctor also finally does what he should have done with Davros and the Daleks decades ago. In Genesis he genuinely thought that he did not have the right to carry out a genocide, even to a race like the Daleks. Now however he feels he has to, as the Daleks are on the cusp of becoming as powerful as the Time Lords themselves. Similarly with Davros we have seen 5 struggle with the decision to kill him as Peter Davison, and be ready from a moral point of view to kill him as Colin Baker, but ultimately still not be prepared from a practical point of view to dispose Davros. The 7th Doctor in contrast is ready for Davros in every respect, and we see that superbly in 7’s final showdown with Davros where he not only tricks him with the hand of omega, but plays on his irrational anger and vanity into provoking him into using it without thinking. The Doctors callousness to Davros as the latter pitifully begs him for mercy is also a brilliant call back to Genesis, except this time its the Doctor ironically, that Davros is begging to show mercy. Remembrance also resolves the Daleks vs Time Lords theme that has been running throughout many previous Dalek stories too. Before I always thought that the idea of Daleks fighting the Time Lords in general, and not just the Doctor was mostly a New Who thing, but on a recent rewatch of all the classic era stories, you can see that it was actually quite a big thread throughout many key Classic era stories. In Planet of the Daleks the Time Lords send the Doctor stop them on Spirodon, in Genesis the Time Lords are terrified of the Daleks to such an extent that they are willing to break their most important law and completely change the history of the entire universe to stop them. Whilst its true that the Time Lords have sent the Doctor to interfere in the affairs of his other foes like the Cybermen in Attack of the Cybermen. They have never gone to such drastic measures before, and so you can see how as early as Genesis, that the Daleks are deemed potentially to be the biggest threat to the Time Lords. Resurrection meanwhile shows the Daleks now be bold enough to take the fight to the Time Lords, albeit in sneaky, underhand ways. It is only thanks to the Doctors actions that either the Renegade or Imperial Daleks are not able to decimate Gallifrey, with the Doctor much like how the Time Lords wanted him to in Genesis finally being prepared to go incredible lengths to end this threat to his people and the rest of the universe once and for all. Remembrance manages to wrap up all of these dangling plot threads to the point where had it been their last appearance then it would have been a satisfactory ending to the monsters. Yet at the same time Remembrance doesn’t salt the earth for future writers either as it does still leave the door open for future stories with the Daleks and Davros. Davros is shown to have escaped the Doctors attempt on his life. Its a brilliant twist that ultimately for all his machinations and carefully thought out plans, the Doctor still underestimates Davros. Furthermore as Davros is still around, then obviously he could easily create a new race of Daleks. Worse as the Doctor thinks they are dead, then they could act in secret, and they still know the secrets of the Time Lords too. Added to that the 7th Doctor, despite his callous, ruthless facade is still shown to be unsure throughout the story, such as in the famous cafe scene, which is a good sequel to the iconic “Have I that right” moment from Genesis. Once again the Doctor looks at his decision from all angles, both morally from a does he have the right to wipe out an entire species, and from the practical of what will the ramifications be of removing such a key power, for better or for worse from the universe. Ultimately however because he is a little older and wiser and been through so much since Tom’s time he makes the opposite decision from the one in Genesis. Just as with the ending of Genesis however, the Doctor and his companions are not sure if they have done the right thing. 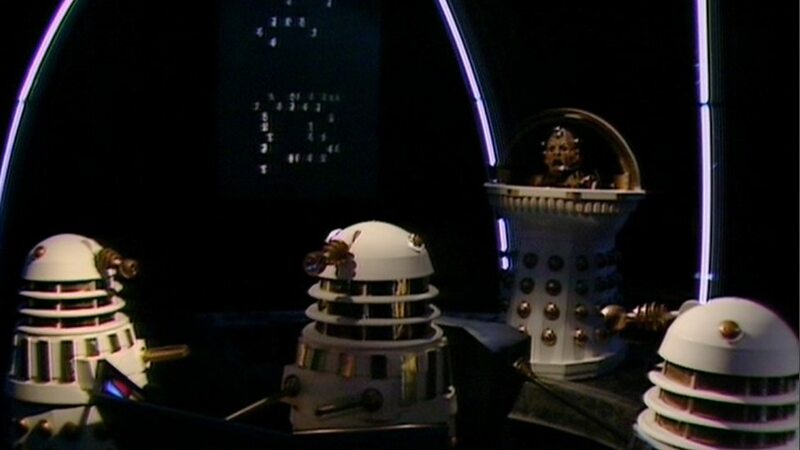 The next Dalek story could have had the Doctor feel guilty at the ruthlessness of his previous selves actions, or maybe he would be devastated to see the Daleks and Davros had survived and be even more determined to destroy them than ever before, knowing how close they came to threatening his people. Aside from bringing all of the major Dalek storylines together to a fantastic conclusion, as a piece of television on its own Remembrance succeeds on virtually all counts. Its brilliantly paced, and with plenty of action and wonderful twists along the way. The first time I saw it I did genuinely think it was Davros in the little girls chair, not just because it physically resembles Davros, but also because you’d never expect him to be the one in the position of power against the Daleks either. Apart from some wobbly Dalek props on location, the stories production values are very strong too with the spaceship effect landing in the playground and the Daleks fights with each other being very well done in particular. The direction all around for the story is excellent. I always loved the opening where we hear the voices of so many key influential figures throughout the 20th century such as Martin Luther King speaking with each other as the Dalek mothership looms towards the earth. It really shows you how all of the problems we have had with each other are NOTHING compared to what’s about to descend on our planet. The acting from the leads is also very strong. You can tell that Sylvester McCoy loves playing the darker Doctor. He’s so much more comfortable and confident in the role. He doesn’t jettison all of the humour however which is a good thing as a large part of his Doctors appeal is his quirky humour. There are some wonderfully funny little moments with Ace such as their arguments in the van, but its never to the extent where you aren’t able to take his Doctor seriously. Sophie Aldred meanwhile makes a very strong debut as Ace. She brings a real physicality to the role of the companion that we haven’t seen before or since, apart from with Leela. The scene where she smashes the Dalek with a baseball bat before she crashes through a window is a particular highlight and shows how Ace is unlike other companions. At the same time however Sophie and the script also bring a real vulnerability to the character too such as in her relationship with Mike, the way she cradles and comforts the young girl after she has been freed from the Daleks control, and the final scene of episode 2 where she is overwhelmed by the Daleks. Finally another notable thing to mention about this story was that it was intended to celebrate the shows 25th anniversary. There are a couple of little clever nods to the past, such as the setting, not only in Coal Hill School, but in 1963, the year the show began. The characters of Professor Rachel Jensen and Allison are also homages to previous companions Barbara and Liz Shaw, whilst Group Captain Gilmore is an obvious stand in for the Brig. Still the continuity references are not like the clips in say The Magicians Apprentice. They serve a purpose in the story, are more slight so as not alienate new viewers and the characters who are homages to previous companions are not just distaff counterparts, but characters in their own right. Rachel Jensen played by Pamela Salem could have been an excellent companion, as she is useful to the Doctor, and her chemistry with Sylvester is brilliant. I’m not saying I would have wanted her to replace Ace or anything, but I would definitely rank her among the one shot characters who could have been companions list. Overall Remembrance of the Daleks is an exciting, action packed, classic story that manages to round off all of the major Dalek story threads from classic who whilst at the same time taking them back to their roots as Nazi parallels, and leaving the door open for future stories with the monsters. Script editor Andrew Cartmel named this as his favourite story out of all the ones he worked on. Terry Molloy’s final performance as Davros on television, but he would reprise the role many times in Big Finish audios. Davros was originally not to have appeared in this story. Its author Ben Aaronivitch said that he felt the character had undermined the Daleks. It was apparently on the suggestion of a prop designer whilst building the Dalek Emperor prop that Davros be included and JNT agreed to it. Others have disputed this however as JNT has also said in various other interviews that Terry Nation forced him to include Davros in every Dalek story he made. The Daleks have turned the little girl into their servant to overcome their reliance on logic. Children are used to man their battle computers as they have a limitless imagination and with the aid of Dalek tech can conceive scenario’s the logical Daleks could not otherwise. The Daleks in the revival are shown to overcome their reliance on logic through the creation of the Cult of Skaro who are given individual personalities and imaginations. When you think about it, what RTD did in the New Series is basically a “simplified” version of the Daleks. There were no mentions of different factions of Daleks, they were all given a new, simple design. Davros didn’t show up until much later, and when he does it’s in his original form and there are no mentions of stories like this. Their appearances in nuWho aren’t continuations of these stories, but “back-to-basics” versions with a new backstory by RTD. In some ways it was quite like a reboot would have been, except that the Time War still allowed the Classic Who stories to have occurred before it took place.